People who are new to catheters may feel nervous, embarrassed, or even concerned when they’re told by their doctors that they need to start self-cathing. We want to reassure you that these feelings are perfectly normal, but that for the many thousands of people with conditions that require catheterization such as urinary retention, neurogenic bladder, spinal cord injuries, and more, intermittent urinary catheters often give them back a sense of independence as well as a better quality of life. We also provide helpful, step-by-step self-catheterization instruction guides for men, women, and children, and we also have convenient online instructions for quick access to show you how to self-cath, including hygienic preparation, catheter insertion, withdrawal, and disposal. This helpful information is for all types of intermittent catheters for males, females, and pediatric customers. Here are a few quick tips to know before you start cathing on your own. If you are too tense, you might have more difficulty inserting your catheter. Don’t force it, especially if you encounter some resistance. Take some calming, relaxing breaths for a few minutes, and try again. Sometimes coughing can also help to loosen the bladder sphincter as well, which may make it easier to insert. As always, you’ll want to either use plenty of lubrication to make the process smooth and comfortable throughout if you’re using a straight intermittent catheter. Most people prefer smaller and easy-to-carry individual packets of sterile lubrication, although many also like using a tube of lubrication. A pre-lubricated closed system catheter or a hydrophilic coated catheter (which is coated with a hydrophilic polymer that becomes slippery when activated by water) may provide an even more hygienic, comfortable, and convenient catheterization experience. 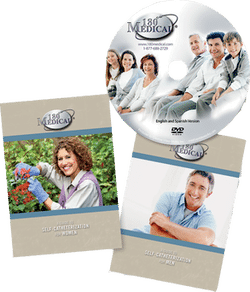 At 180 Medical, we gladly do the legwork for you to check with your health insurance provider to see if these advanced catheter products are covered by your policy, and we also get any necessary documentation from your doctor that your insurance may require. Some people have difficulty inserting straight tip catheters and may need to consider using a catheter with a curved tip. This is known most commonly as a coudé tip catheter, which is available in the original straight technology, hydrophilic, and closed system catheter options. As this is most common to men, whether due to a stricture, blockage, or an enlarged prostate, coudé tips are usually only available in male length (16 inches or longer). If you can’t insert a straight catheter, coudé catheter insertion may be far easier, so you will want to address that issue with your doctor to see if a coudé catheter is right for you. Talk to your doctor about what type of catheter might be the right option for you and your individual needs and anatomy. Most people choose to use a new sterile disposable catheter each time they need to self-catheterize. Keep in mind that that intermittent catheters are considered single-use only devices. These guidelines are stamped on every intermittent catheter’s package, alongside some of the other important symbols on your catheter package. The sterile-use guideline typically looks like a 2 with a slash across it, so that you know to only use a catheter one time. Find out more about the risks of washing and reusing catheters. 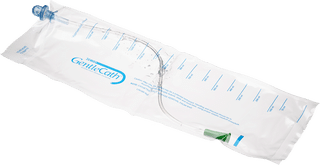 If you have any other questions about how to self-cath or if you want to know more about certain catheter products, feel free to contact 180 Medical for all of your catheter supply needs!